Handy Flight Fuelers For Glow Fuel Only These super tough syringes are extremely handy for a multitude of tasks at the flight line. Perfect for priming engines and quick filling small fuel tanks. The graduated scale on the side allows accurate measurement of the exact amount of fuel needed. Markings are in both metric and standard fluid ounces. Especially good for C/L combat flying or outdoor F/F, where a precise injection of fuel into a pacifier or bladder is required. Also great for drawing the last little bit of leftover fuel from the tank after flying. 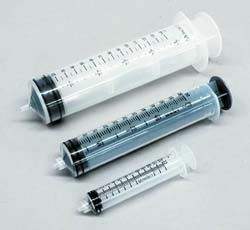 These heavy-duty plastic syringes are quick and easy to use! Comes with a piece of SIG heat-proof silicone fuel tubing for quick-connecting to the tank.